a nefa based World War I project. With support from the Heritage Lottery Fund, Aberdeenshire's Heritage Education Partnership has now completed the 'Hard Vrocht Grun' project, which is the creation of an education resource for schools, colleges and researchers that explores the effect of World War 1 on the North-east of Scotland. The resource, in pdf format, can be downloaded here. Work, Food & Poverty - looking at how life was affected by the War on the Home Front. Objection & Exemption - looking at issues surrounding conscription, conscientious objection, and other reasons for exemption. Loss, Return, & Commemoration - looking at the after effects of war on families, returning members of the armed forces, and the reaction of communities to the experience of War. The projects are designed to take students with support from their teachers through the process of guided research using set document bundles, to independent research using local heritage organisations (e.g. Archives, Libraries, heritage societies resources), and through to adapting their research findings into a variety of formats. The booklets lead the students through the process by means of activities and guidance, encouraging them to be creative with their final reporting. For example, they suggest that findings on an objection and exemption project could take the form of a role-play debate based on a tribunal appeal record from local newspapers. This is not the end of the project, as supporting Creative Arts projects are due to be run in selected secondary schools at the beginning of the 2014/15 school session. Results of these will be posted up on NEFA when they are complete in order to demonstrate how the packs can be used in schools. There will also be facilities to post up results of any other projects run from the packs, and any other new material that is discovered by schools in the process of working through them. This means that the site will be expanding and changing in the next few months so watch this space! "Dockens Afore His Peers" A teaching resource linked to the Hard Vrocht Grun pack exploring Charles Murray's poem about issues relating to conscription and how it affected agriculture in North East Scotland. Produced in collaboration with Education Scotland. 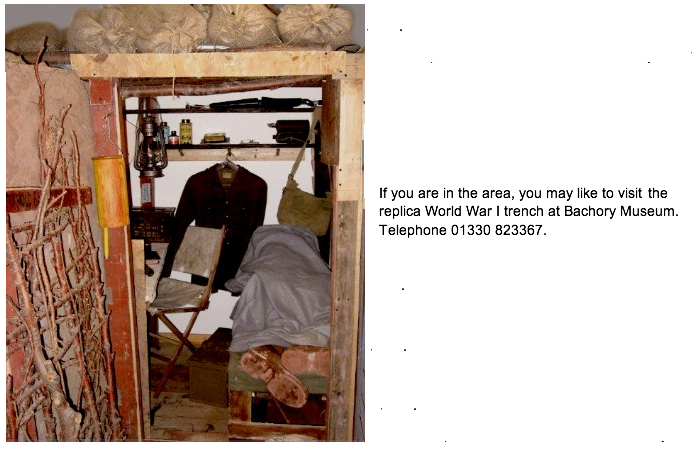 WWI trench at Banchory Museum. Inverurie War Memorial. An in depth study of Inverurie's war dead, courtesy of Inverurie Library's local history volunteers.